We evaluate the real success of our employees within OTI Holding based on their contribution to performing and wide-spreading the main values and work principles of OTI Holding. 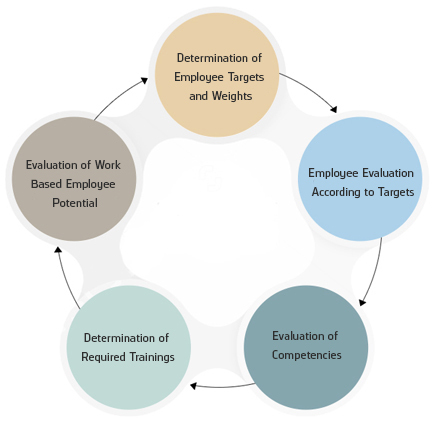 In order to evaluate the performance and individual contributions of the individuals, make constructive feedbacks based on real work samples, mutually evaluate the career targets and training needs, we provide data to the promotion system, career planning and planning of training programs depending on development of the individuals professionally and personally as a result of performance evaluation based on the applied target and competency. Taking into consideration your target and competency based system print outs, you may get the opportunity of changing your career paths according to our global and local needs and earning different experiences in different countries instead of being limited with the country you live in. We subject our employees to different preparation processes in different work fields, different positions and locations and provide back up for top positions. • Taking into consideration your target and competency based system print outs, you may get the opportunity of changing your career paths according to our global and local needs and earning different experiences in different countries instead of being limited with the country you live in. • We subject our employees to different preparation processes in different work fields, different positions and locations and make back up for top positions. hr@otiholding.com Click for job application.